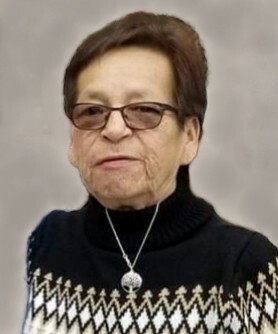 Fern Panamick passed away peacefully at Health Sciences North, on Thursday, April 11th, 2019. Age 63 years. Beloved wife of Eddy Panamick. Loving mother of Alex (Christina), Edward Jr., Derek, April (Calvin), and Dylan. Cherished ‘Mama’ of David, Cheyanne, Zack, Ashley, Nicholas, Tewas, Marcus, Athena, Nickalaus, Horatio, Teekia, and Jojo. Adored Great Grandma of Malachai, Raidyn, and Francis. Dear sister of Victor (Marlene), Morris (Marina), Valerie, Percy (Dee), and Carl. Loving Godmother of Christopher (Brittany). Forever missed by her uncles, Aunties, nieces, nephews, other relatives, and friends. Resting at the family home (56 Sub Road, Pickerel), where friends will be received from Saturday afternoon, until the Service on Monday, April 15th at 11:00 A.M. Interment Henvy Inlet First Nation. Traditional feast to follow. Send a condolence to the family of FERN PANAMICK.